To hear a clip, click here. Then of course there's the Rich Little/Ronald Reagan reboot 20 years later. Same guy (Earle Doud) on the far left on the cover photo. Meader wasn't the only guy doing JFK LPs. I have ones by at least a couple other guys. Also have the Kruschev one but didn't think it was very good. I have both LPs and loved it (maybe because am a Republican)? 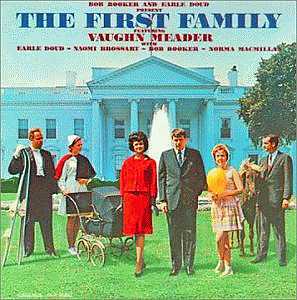 Did you know the Kennedy Family was not the only family that had an LP...so did Krushchev (I have it)? Threw mine out only last year. (What's the point anymore, I figured). HenryM has passed along a link to a song from the same era sung by a 7-year-old girl named Little Jo Ann. It's titled "My Daddy is President". I still have my copy as well, but it has not been played since November, 1963. I have this LP. I remember it being popular, but after the assassnation many people destroyed their copies out of respect.